Lock in a great price for Phi Phi Relax Beach Resort – rated 8 by recent guests! Great location and beach for swimming and snorkeling at the coral reef. Friendly staff in a restaurant and bar, right on the beach. Room - bungalow in the Thi style with a view and balcony - porch was spectacular. Very confortable. Good place to relax. Loved the huts, yummy dinner specials every night, the excursion we took that we booked thru resort was awesome !! Great tour guides. Yummy Thai coffee and Thai green tea . Nice, quiet place for a couple of days. Beautiful beach and great food! Also some beautiful nature to see there. We stayed in a Top Sea View Bungalow and the views were spectacular, the bungalow is spacious, very clean with a cute outdoor terrace. The food is great although they should let us choose more options for the breakfast. The sea is amazing with clear water for swimming and snorkeling. We had a great stay and definitely I recommend it. The staff made everything worth it. Amazing people! Great beach and nature. Although the reception lady and some waiteres was not happy but most staff are great, smiling and helpful. Food generally was ok. Bbq chicken was great. Bungalow was great, can lay outside the door. Mattress for beach. A lot of fish in the coral reef near beach. But sea lice was irritating to snorkeling for long minutes. Very nice beach, nice staff, nice restaurant and massage. The room are essential but you will have everything you need! Very relaxing place! The location was great. Bungalows were cozy and private. Food wasn’t too expensive. Most of the staff were informative and helpful. 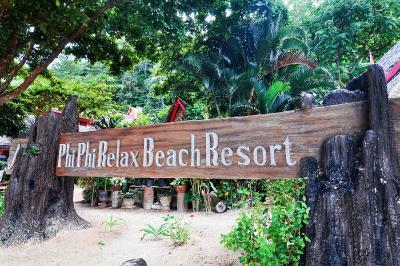 Phi Phi Relax Beach Resort This rating is a reflection of how the property compares to the industry standard when it comes to price, facilities and services available. It's based on a self-evaluation by the property. Use this rating to help choose your stay! Located on a tranquil spot on beautiful Pak Nam Beach, Phi Phi Relax Resort offers simple bungalows up on the hillside and steps from excellent snorkeling spots. Surrounded by tropical gardens, they all have private balconies with views out to sea or the tropical landscape. 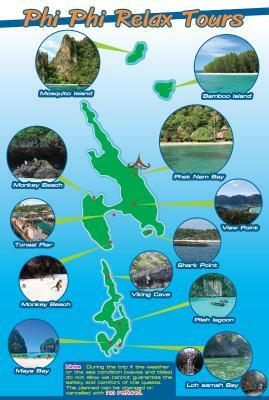 Phi Phi Relax Resort is a 25-minute boat ride from the main pier in Ton Sai Bay. 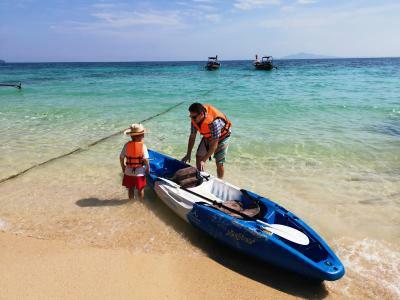 Boat transfers from Tonsai Pier to the resort are available 4 times a day at an extra charge. 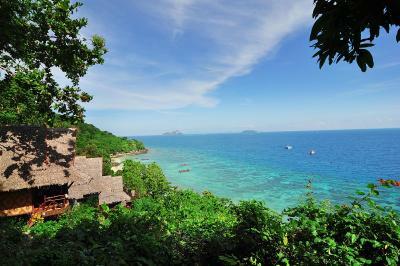 Conveniently located between Ran Ti Bay and Lo Bao Kao Bay, the resort offers a variety of island tours and excursions. 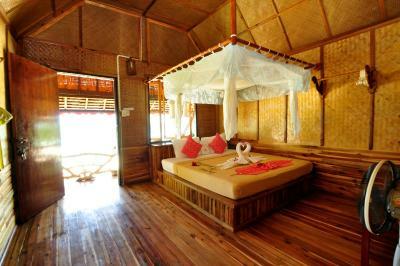 Bungalows are simply furnished, featuring thatched roofs and bamboo walls. They have an private bathroom with a cold-water shower and offer views of the ocean or tropical landscape. Guests can enjoy snorkeling at the colorful reef, rent out a kayak or just relax in a deck chair or hammock looking out to the neighboring islands. Pampering massages and fishing trips are also available. For more adventure, follow the trail up through the jungle to town. For convenience, the resort provides a restaurant which serves breakfast, lunch and dinner. They offer Thai and Western dishes, and refreshing cocktails and fruit juices at the Beach Bar. Both are set directly by the beach. 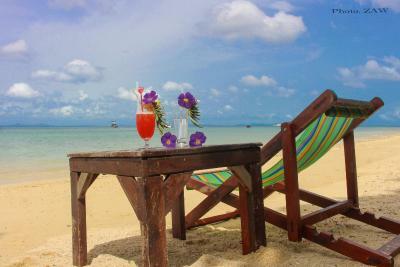 When would you like to stay at Phi Phi Relax Beach Resort? Bungalow is located near the beach. Bungalow is surrounded by tropical landscaping and located steps from the beach. Located higher up and surrounded by tropical gardens, this bungalow provides panoramic sea views and views of surrounding islands from the private balcony. 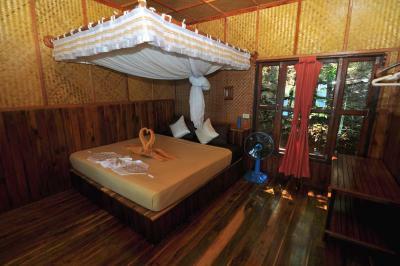 House Rules Phi Phi Relax Beach Resort takes special requests – add in the next step! Phi Phi Relax Beach Resort accepts these cards and reserves the right to temporarily hold an amount prior to arrival. Please be informed that there is no hot water in the shower. Please note that property is only reachable via boat from Phuket and Krabi. Please note that the resort provides a scheduled boat transfer from Tonsai Pier to the property. The scheduled transfers are available at 11:30, 13:30, 16:00 and 17:30 hrs. Please be informed that this service comes with an extra charge. Guests are kindly advised to contact the property directly for more information. Contact information can be found on the booking confirmation. Kindly provide all the guests' names and information in English during the booking process. Please note that for bookings made from 22 May 2018 onwards, a compulsory Gala Dinner is included in the room rates of 24 and 31 December 2019. The rates of the Gala Dinner are based on room type and occupancy (guests sleeping in extra bed will be charged separately). Wifi is bad, If there have A/C and refrigerator will be so perfect! I like that staff are so nice, there was a staff name is...Nee I am not sure hahaha But she was so good and kind. She gave us free red curry and provide useful information:) The view was very amazing! When wake up early morning to see sunrise! The location is really far from anything and the beach is really rocky there are hours of the day that the beach is not accessible because of the tides, the food was not good, we left a day earlier because there was nothing to do there and lost our money. Its a hotel in which you cannot go outside and get to know the island, you have to pay a taxi boat (they dont have this service at night) or you have to cross the jungle by walking. The waiters and waitresses were rude, when we raised our hands to ask for something, they turned their heads as if they had not seen us. Everything had to be consumed in the hotel because you were away from civilization, and also everything was really really expensive. I would never go back to this hotel. I also recommend you not to go. Accommodation gets really hot and WiFi is almost none existent but if you’re there to relax, who cares! There was only fans in the room, but it was mentioned in the description of the rooms as well. Lovely place on busy Phi phi island. It’s away from the city noises and has such a relaxing environment. We totally loved our stay ! You are completely isolated from everything. The sun sets on the other side of the island. The lights and bar was shut down at 11. Massage place is in open are with no privacy. And the biggest shock was no air conditioning. 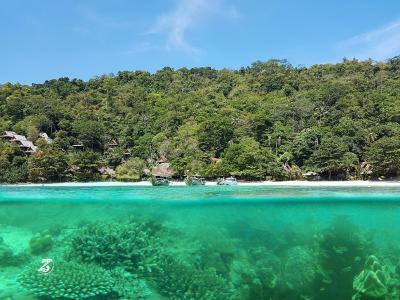 It is an amazing place for snorkelling, sunrise watching and just disconnecting from everything. Location. It takes 30 mins by long tail boat to get to the town. And the boats schedule only twice in the morning and three times in the afternoon. The last boat is at 5:30pm. So basically you can not do anything in the town at night unless you pay for 1000bht for a taxi boat. The food in the hotel restaurant is very good. Unfortunately there is some staff who are not very nice. There is no hot shower in this hotel, so be aware of that. Wifi is the nightmare.. It gets very frustrating to connect to the internet. The beach view is beautiful. The path to the room is nice and peaceful. It’s a quieter and less crowded place to relax. Obv aircon would be a bonus but that all adds to the authenticity of the place!